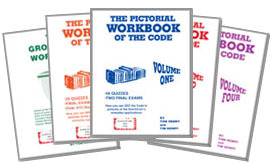 The Code book in pictures. Volume Three covers Articles 280 thru 398 in pictures. This workbook includes over 415 questions with answers in 29 quizzes and one final exam. Now you can SEE the Code in the Electrician's everyday applications.